Some hearts must have skipped a beat in England's East Midlands late on Tuesday night. 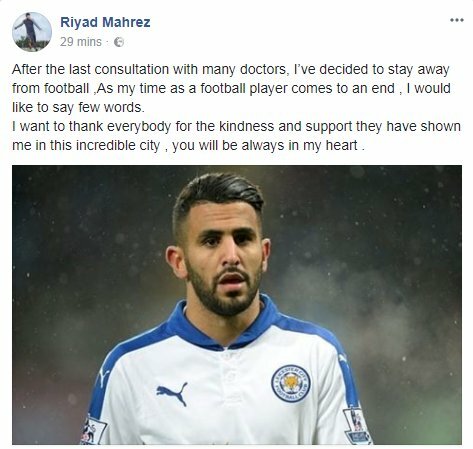 A post on Riyad Mahrez's official Facebook page appeared to suggest that the Leicester player was retiring from football or at the very least taking a break from the game. After the last consultation with many doctors, I’ve decided to stay away from football, As my time as a football player comes to an end, I would like to say few words. Unsurprisingly, according to Sky Sports, the statement was posted as a result of Mahrez's account being hacked. At the weekend, Mahrez scored a superb 97th minute free kick which rescued a point for Leicester against Bournemouth. It was the Algerian international's first goal for the club since Man City tried and failed to sign him during the January transfer window.